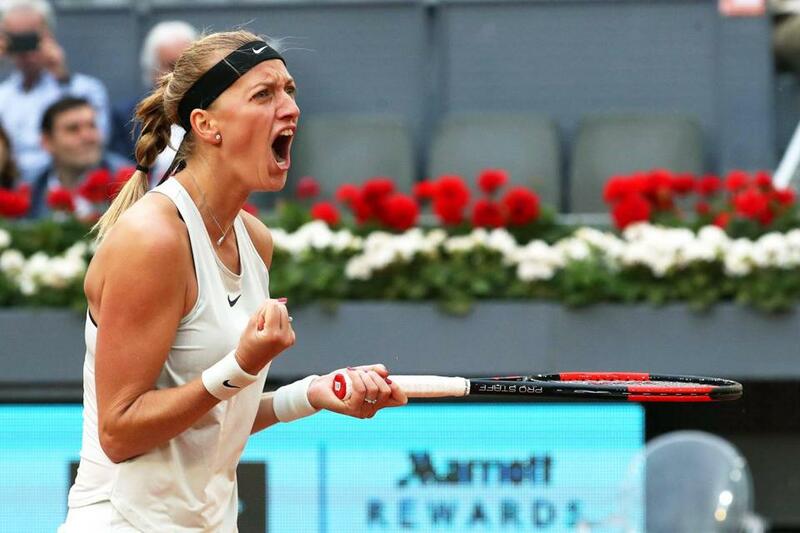 Petra Kvitova is pumped after knocking off Kiki Bertens for her record third Madrid Open title. Tenth seed Petra Kvitova claimed a record third Madrid Open tennis title on Saturday, outlasting Kiki Bertens, 7-6 (8-6), 4-6, 6-3. The two-time Wimbledon winner celebrated her hard-fought victory in the nearly three-hour finale when the unseeded Bertens hit a backhand long on the final point. Kvitova previously won Madrid in 2011 and 2015. This win took the Czech Republic native’s career total to 24 titles, including four in the first five months of 2018. Kvitova was playing her 11th match in 13 days after also winning the Prague Open last weekend. The key moment of the match came when Bertens appeared to have swung the momentum in her favor by pulling back a break in the third set, only for Kvitova to strike right back and recover the advantage for a 5-3 lead. She served out for the championship. Bertens’s appearance in the final meant she will rise to a career-high 15th in the rankings. On the men’s side, second-seeded Alexander Zverev brushed aside Denis Shapovalov, 6-4, 6-1, to reach the final, where he will face fifth seed Dominic Thiem, a 6-4, 6-2 winner over sixth seed Kevin Anderson. Clare Droesch, the former Boston College women’s basketball player who helped the Eagles to the 2004 Big East title, has died after a six-plus year battle with cancer. She was 36. The school said the New York native died Friday at home. Droesch was diagnosed with breast cancer in December 2011. Droesch scored 1,136 points for BC — 12th best in school history. She averaged 9.0 points, 4.3 rebounds, and 2.5 assists from 2001-05. She helped the Eagles reach the NCAA Tournament all four seasons, including two Sweet 16 appearances. She was honored as a ACC Legend in 2015 by the conference . . . Buddy Carr and Ben Spencer had three goals apiece but No. 15 UMass (12-5) saw its fourth-quarter rally fall short in its 15-13 loss to No. 5 Yale (14-3) in the first round of the NCAA Division 1 men’s lacrosse tournament at New Haven. Jackson Morrill scored seven times for the Bulldogs . . . Nick Shanks had four goals and two assists and Mason Pollack made 19 saves as host Tufts (18-1) advanced to the NCAA Division 3 men’s lacrosse tournament quarterfinals with an 18-11 win over Ithaca (16-4) . . . Catherine Lawliss scored four goals to lead the Tufts women’s lacrosse team (13-4) to a 17-8 first-round win over FDU-Florham (15-5) in the NCAA Division 3 women’s lacrosse tournament . . . Lexi Lenaghan scored four goals and added two assists to reach 100 points on the season and Babson ran away with a 17-4 win over Castleton in an NCAA Tournament women’s first-round game in Middlebury, Vt.
Nashville Predators center Mike Fisher retired after an 18-year NHL career. The 37-year-old center had two goals and two assists in 16 games with the Predators this season after signing a contract Feb. 26. He added one goal in 12 playoffs games. Fisher was Nashville’s captain last season before retiring in August after the Predators lost in six games to the Pittsburgh Penguins in the Stanley Cup Final. He said he doesn’t plan to come out of retirement again. Fisher did not play in Thursday’s second-round Game 7 loss to the Winnipeg Jets because of a lower-body injury . . . Nicklas Backstrom (right hand) is day to day but Washington Capitals coach Barry Trotz said he is optimistic the center will be able to play at some point in the Eastern Conference finals against the Tampa Bay Lightning. Backstrom has missed two games because of the injury which he sustained blocking a shot in Game 5 of the second round against the Pittsburgh Penguins. 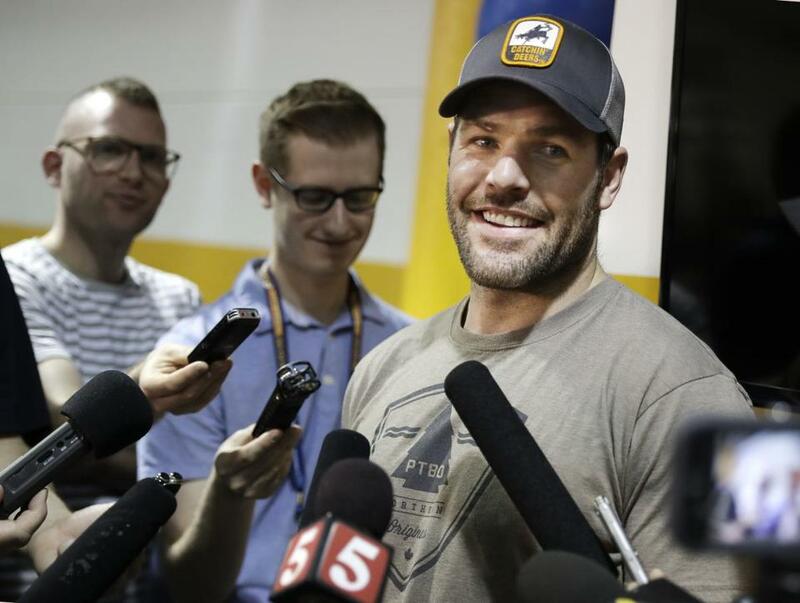 Mike Fisher’s comeback lasted just a few months, until the Predators’ second-round exit from the playoffs. Mikko Rantanen scored twice and Harri Sateri made 30 saves to lead Finland to a 5-1 win over Canada at the world championships at Herning, Denmark. Canada’s Curtis McElhinney was pulled with 3:25 remaining in the opening period after allowing three goals on nine shots. With the win, Finland jumped to second in Group B with 12 points, one behind the United States. Denmark is another point back in third and Canada remains at 10 in fourth followed by Latvia with 9. Frans Nielsen, Jesper Jensen, and Nichlas Hardt scored for host Denmark, which kept alive its dream of reaching the quarterfinals with a 3-1 win over South Korea. Ronalds Kenins, Guntis Galvins, and Andris Dzerins scored as Latvia beat Germany, 3-1, to stay in contention. In Group A at Copenhagen, Mika Zibanejad gave defending champ Sweden a 4-3 overtime win over Slovakia with a power-play goal with 41 seconds remaining, Kirill Kaprizov, Evgenii Dadonov, Nikita Nesterov, and Mikhail Grigorenko scored as Russia topped Switzerland, 4-3, and Konstantin Komarek had a goal and an assist in Austria’s 4-0 win over Belarus. Sweden leads Group A 14 points, with Russia 1 point back. Switzerland and the Czech Republic have 9, Slovakia 8, and Austria 4. The first four teams from each group advance to the quarterfinals. Ukrainian boxer Vasiliy Lomachenko (11-1, 9 KOs) stopped Venezuela’s Jorge Linares (44-4, 27 KOs) at 2:08 of the 10th round of their WBA lightweight championship fight at Madison Square Garden to win a title in his third weight class in just his 12th pro bout. Lomachenko landed a hard left to the body during a flurry of precision punches that sent Linares to his knee. Linares got up but the referee called the bout. Lomachenko added the 135-pound title to his belts at 126 and 130 pounds. Linares hadn’t lost since 2012 . . . Russia’s Sergey Kovalev (32-2-1, 28 KOs) will defend his light heavyweight title against Colombian Eleider Alvarez (23-0, 11 KOs) on Aug. 4 in the first professional boxing match at the Hard Rock Hotel & Casino Atlantic City, the New Jersey venue set to open June 28 . . . Will Power pulled away from Scott Dixon to win by 2.2443 seconds in Indianapolis, his second straight IndyCar Grand Prix victory. Power dominated on the 2.439-mile, 14-turn road course. He led a race-high 56 laps, including the last 34 . . . Lewis Hamilton ended Sebastian Vettel’s dominant run in Formula One qualifying by setting a track record and winning pole position for Sunday’s Spanish Grand Prix in Barcelona. Hamilton’s lap of 1 minute, 16.173 seconds was only four hundredths of a second ahead of Valtteri Bottas. Vettel, who won three straight poles, will start third . . . Milwaukee Brewers righthander Chase Anderson was scratched from his scheduled start against Colorado Saturday night because of a stomach illness. Lefthander Brent Suter moved up a spot in the rotation in his place . . . Ecuadoran cyclist Richard Carapaz has won the eighth stage of the Giro d'Italia, storming up the end of the final climb of the 129.9-mile leg ffrom Praia a Mare to Montevergine di Mercogliano to pass Dutchman Koen Bouwman. Britain’s Simon Yates remains in the overall lead, 16 seconds ahead of Tom Dumoulin of the Netherlands and 26 clear of Colombia’s Esteban Chaves . . . Mike Lorenzo-Vera of France hit a stunning 8-under-par 63 to take a two-shot lead into the final round of the Sicilian Open at Sciacca in the hunt for his first European Tour title. Countryman Julien Guerrier (67) is two shots behind along with Joakim Lagergren of Sweden (63) . . . German soccer team Hamburger SV beat Borussia Moenchengladbach, 2-1, behind goals from Aaron Hunt and Lewis Holtby, but the club was relegated from the Bundesliga for the first time ever. Hamburger was the only ever-present Bundesliga club since the league was founded in 1963, but was the victim of Wolfsburg’s 4-1 home victory over Cologne. 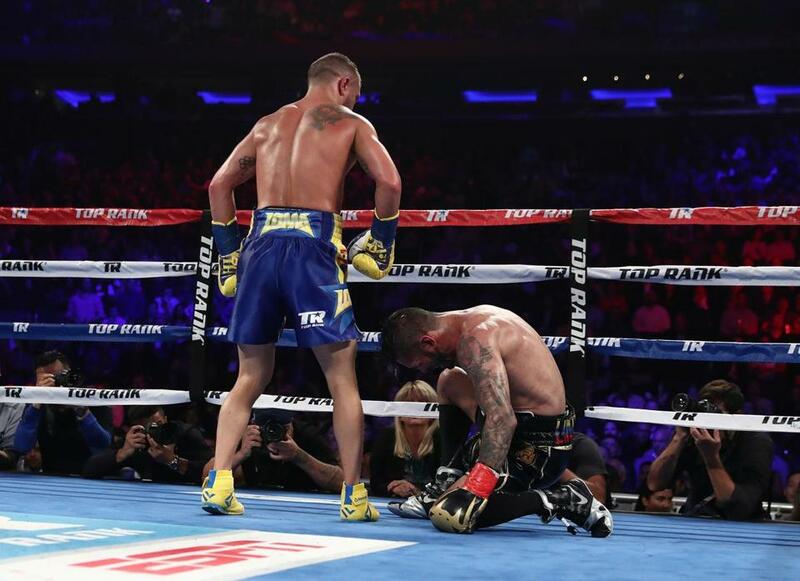 Vasiliy Lomachenko (left) stands over Jorge Linares after knocking him down in the tenth round.